Do you have a website? Have you checked the loading time of it? A slow website reduces the page views and conversions. A Recent study shows that 47% of the population expects the web page to load in seconds and 40% of people leaves the page if they find it slower. Aren’t you bit concerned now? Don’t worry! 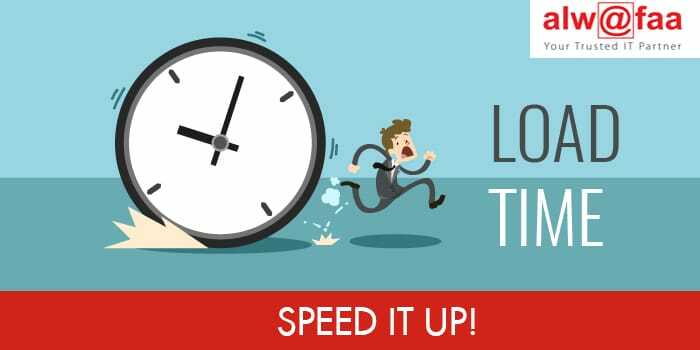 We can give you tips to improve the speed of your site. Referring to Yahoo, 80% of a Web page’s load time is spent downloading the different pieces-parts of the page: images, style sheets, scripts, flash, etc. An HTTP request is made for each one of these elements, so the more on-page components, the longer it takes for the page to render. To be frank, it is very annoying and sometimes most of the displays won’t be accessible. Make sure the number of elements on your page is less. Make use of CSS instead of images whenever and wherever possible. You can try to combine multiple style sheets into one. Cut short the writings and put them in the footer. Always remember to make it simple and easily understandable. Check your site’s speed in Yslow or Google Page speed tools. It will give you an idea of how fast or slow your site is. Take a serious look into that and do the needful. High-quality contents are often 100kb or more. Obviously, they’re very bulky and slow to download. The best way to speed their load time is to zip them—a technique called compression. It decreases the bandwidth of your pages, thereby reducing HTTP response. Gzip tool is apt for this. Whenever you visit a website, the elements on the page you visit are stored on your hard drive in a cache, so the next time you visit the site, your browser can load the page without having to send another HTTP request to the server. It helps in reducing the time taken for searches by the visitor. We know that WYSIWYG resources make it easy to build a Web page, but they may create messy code—and that can slow your website considerably. Every unnecessary piece of code adds to the size of the page, it is always to keep the page less complicated. Give your focus to size, format and the src attribute of images. Make it small, try to use the JPEG or PNG format and make sure you use the GIF’ which are small in. At last get the codes right! Isn’t it simple? Next time try to give attention to these concepts. Too many plugins can definitely reduce the speed of your site and can create a bad impact on viewership. Try selectively disabling plugins, then measure the server performance. This way you can identify any plugins that harm your site speed.